Your dorm room provides you with the perfect opportunity to show off your style with unique college decor. There are so many college supplies that you can add to your dorm room to make it look amazing and a big part of your dorm decor will be your Twin XL bedding. Decorative college bedding is an easy way to make an impact on the overall look of your dorm room! At DormCo, we believe you shouldn't settle when it comes to the comfort and style of such an important part of your college decor. That is why we offer awesome Twin XL bedding that will look good and feel great on your dorm bed! One of a kind college quilts like our Glacier Gray Relaxin' Chevron Ruffles Quilt - Single Tone - Twin XL are a perfect example of how comfort and style can combine to make an essential decorative dorm bedding item. Filled with a comfy cotton and polyester blend and covered with super soft to the touch lightweight cotton fabric, this dorm quilt will give you the right amount of comfort. And with such a unique look it will also be a great addition to your dorm room decor! Gray dorm bedding makes it easy to match your college decor and the rest of your Twin XL bedding. But this gray Twin extra long quilt has enough style that it will still stand out in your dorm room. 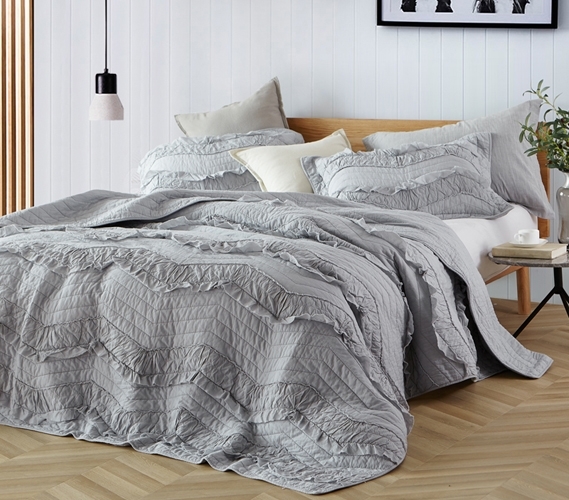 The textured ruffle design and popular chevron pattern give this gray Twin XL quilt a stylish look that will make your college bedding one-of-a-kind!